In Part I we discussed ionizing radiation and how it poses health risks to humans. In this section look at contributing factors of radiation dosage and the sources of ionizing radiation. There are three main factors for radiation dosage: tissue sensitivity, the amount of radiation, and the type of radiation. Tissue sensitivity to radiation is related to the rate of cell division. Rapidly-dividing cells have a greater potential for producing cells with damaged DNA. 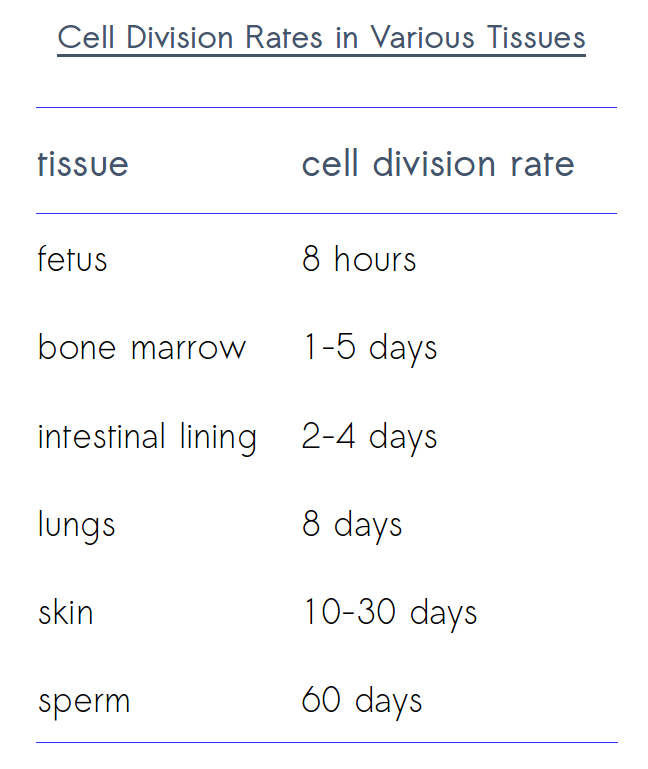 With rapidly-dividing cells, there is a greater likelihood that cell division will occur before cell death. This leads to the production of more mutated cells with corrupted DNA that continue to create more mutated cells. DNA includes information about the rate of cell division. When this information is corrupted mutated cells can divide more quickly causing accelerated growths which is often associated with cancer. There will be more and more generations of mutated cells, which themselves may be exposed to radiation. As a result, mutations can accumulate over cell generations. Together these factors can have a snowball effect on both the amount of mutated cells and the evolution of genetic mutations. This is why tissues with rapidly-dividing cells are more susceptible to being damaged by ionizing radiation. The risk is higher for children and adolescents because they are still growing and, in general, their cells are dividing more quickly. For the same reason fetuses are especially vulnerable to radiation. Radiation amounts can be thought of in terms of the concentration and duration of radiation exposure. In general, more ionizing radiation is worse for you. This seems intuitive. The same is true for concentration and duration. Higher concentrations and/or longer durations pose a greater health risk. There are some finer points to consider relating to the different risks associated with high and lose radiation doses, and radiation thresholds. High concentrations of radiation kills cells effectively and indiscriminately. When used as medical treatments to kill cancer cells, it often has some collateral damage by also killing healthy cells. New technologies have greatly improved the accuracy of these procedures and can better target cancer cells. However some risks still remain. Low concentrations of radiation can increase the risk of long term effects such as cancer. If the radiation has a low concentration and/or it is delivered over a long period of time, the immediate health risks are substantially lower because there is a greater likelihood of the cells repairing the damage without dying. However, there is still a risk of incorrect repairs and long-term effects such as cancer which may appear years or even decades later. There are different schools of thought when it comes to the idea that radiation only becomes harmful beyond certain levels of exposure. While everyone agrees that, beyond such levels, more radiation is worse, adherents of the Linear No-Threshold Model believe all levels of radiation is considered harmful. We like the no-threshold approach because it is simple, makes less assumptions about safety, and because it is a more conservative approach to managing health risks. Lower risks associated with small amounts of exposure is less likely to materialize into observable outcomes. The risks, however small, still exist. There is no safe amount of radiation or radioactive material. Even small amounts do harm. The type of radiation, or the radioisotope, has bearing on the tissues impacted and the severity of damaged based on the type of decay. The chemical structure of radioisotopes, in large part, determines where it will be concentrated in the body. For example, Strontium-90, also known as “The Bone Seeker”, concentrates in the bones because its structure resembles that of calcium. Similarly, Iodine-131 (I-131) concentrates in the thyroid because the thyroid cannot distinguish I-131 from other forms of iodine. As previously mentioned, alpha-particles, beta-particles and gamma-rays have different characteristics in terms of the amount of energy carried and the ability to penetrate various materials. All else being equal, beta-particles do more damage than alpha-particles, and gamma-rays are the most dangerous type of radiation. 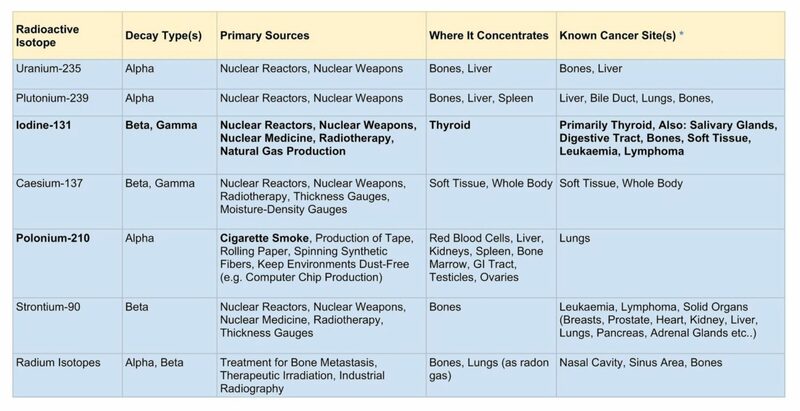 Here are some radioactive isotopes (radioactive forms of elements) that one is mostly likely to encounter along with their decay types, sources, areas of concentration in the body, and associated cancers. Nuclear Medicine is mostly used for imaging and tracing functions in the body. Radiotherapy is often used as part of a cancer treatment to kill problematic cancer cells. Radiation dosage is determined by the tissues affected, the concentration and duration of the exposure, and the radionuclides involved. The dosage is increased when the affected tissues have rapidly-dividing cells. Higher concentrations and longer durations both increase the dosage. Radioisotopes with beta and gamma decays represent a higher dosage, especially when exposed to parts of the body where they are more likely to be concentrated. There are numerous examples of how ionizing radiation is used as modern day tools. Here are some examples to give a sense of the breadth of the applications. Technicians target and kill cancer cells with gamma-rays. It is like using radiation as a surgical knife. In fact, there is a radiation therapy that uses computerized treatment planning software to help physicians locate and irradiate small targets. It is called The Gamma Knife. Ionizing radiation is also used as tracers in the body for imaging and to help with diagnosis. Radioisotopes are employed as tracers to detect leaks in pipes. Manufacturers of paper, plastic and metal sheets use alpha- and beta-particles to accurately detect sheet thickness while providing instant feedback to machines that control thickness. Radioisotopes are also added to lubricants to determine the extent of wear and tear on machine parts. Pests are exposed to gamma-rays which induces mutation and prevents them from reproducing. Radioisotopes are used to develop new strains of genetically modified crops (GMO) that produce higher yields and arguably better quality. 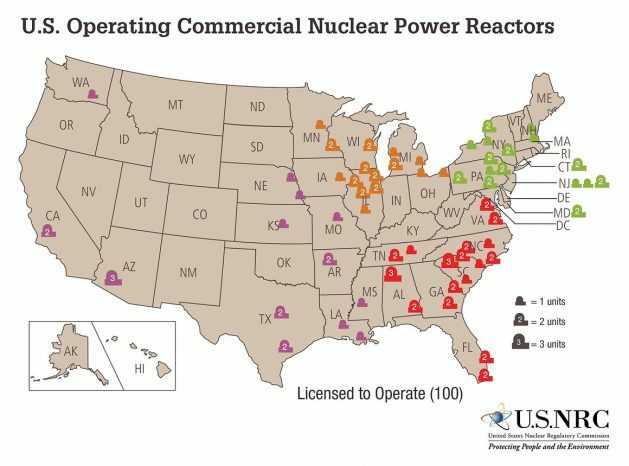 Despite the inherent dangers, nuclear power plants are increasingly being sought by nations to supply their energy needs. It is an efficient means of generating energy which also affords nations with greater autonomy. Though strictly regulated, there still remains risks of nuclear reactor accidents due to operational errors, spills during the transportation and storage of nuclear waste, natural disasters (as with Fukushima in 2011) and war. Nuclear power facilities may become targets in military strikes. While there are increasing concerns about the use of nuclear weapons, the public needs to become more aware of how nuclear weapons tests are poisoning our biosphere. Keep in mind that many of the radioactive by-products never existed on the planet prior to our discovery of radiation. These include Iodine-131, Caesium-137 and Strontium-90. The locations of the test sites are well distributed around the globe as they are carried out by various nations. Each time a nuclear weapon is detonated its radioactive by-products are deposited in soil, rocks, water and the air. Ocean currents and jet streams help to further distribute these toxic by-products throughout the world. The following 6 mintue video shows the increasingly destructive capacity of nuclear weapons over time. The universe is about 13.8 billion years old. Life on earth is said to be 4 billion years old. Radiant matter was only discovered 140 years ago. Since then we have been experimenting with it on increasingly larger scales. It is estimated that we currently receive half of our radiation exposure from man-made sources and this amount is increasing. Can our defence mechanisms evolve quickly enough to keep up with the increasing amounts of radiation exposure introduced by man? The prevalence of cancers suggest the answer is no. The following 3 mintue video is a time-lapse map of nuclear explosions which have taken place between 1945 and 2009. 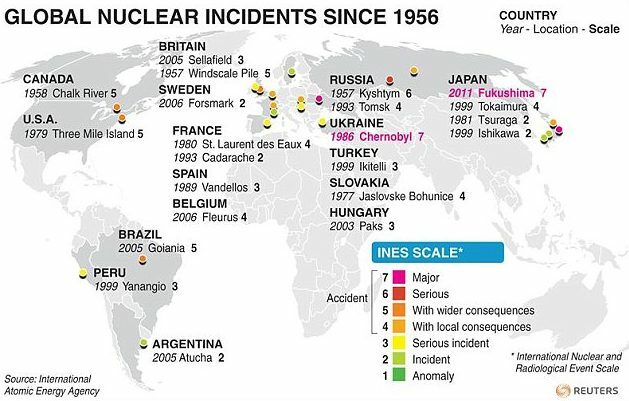 This gives us a sense of the frequency and distribution of radionuclides throughout the world. In Part III we will discuss the importance of supplementing with iodine and other measures one we take to reduce radiation health risks.